I like it! It's well documented that VTA light rail is a poor performing system but this is a great start. 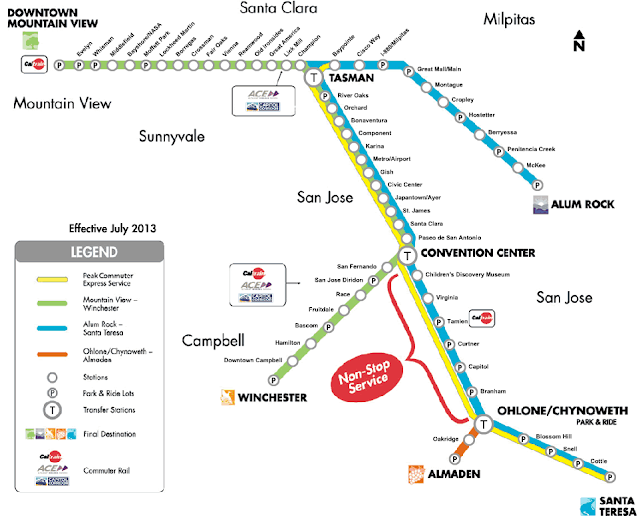 With BART opening in Milpitas and Caltrain in Mountain View (connecting to SF), it's a no-brainer to make a new Red Line. Plus, there is plenty of development going on along North First St that will drive ridership. Oakland somehow managed to get funding for a people-mover from BART to their airport...perhaps we can do the same for SJC??? The Campbell line already gets brutal 30-minute headways most of the day. Now it's being converted to a spur line so we have to transfer. Why does VTA hate Campbell so much?? Still wish that somehow they could make Light-Rail through downtown a true streetcar much like Muni trolleys running down Market Street SF. Run the Light-Rail trains at auto, bus speeds vs pedestrian "speeds." Probably to expensive and to late to consider a redesign downtown. Oh well..
People exaggerate how slow LR is in downtown, it only takes 4-5 mins from Convention Center to St. James...eliminating stations would also be dumb since non of them are designed for high capacity. The downtown stations (Santa Clara and Paseo, in particular) have the highest ridership numbers of the whole system. As someone who takes light rail for several months from SSJ to NSJ, I can that the Downtown section is NOT the bottleneck. In fact, there is a survey many years ago where the LRT's Downtown section averaged about 9 miles per hour, which placed it above average against other cities's LRT downtown section. So it's not as bad as anti-LRT people like to make it out to be. Taking off one or two stations won't really reduce the time that much. Right now it's about 6-8 minutes through downtown, getting rid of 2 stations would only bring it down to closer to 6 minutes. Not worth it. The SLOWEST section is the North SJ section. This is where the most speed improvements can be made. I like that they're going to increase speed to 45 mph. It's about freaking time. The best would be to run even more express trains, especially along NSJ and Baypointe-Alum Rock section of both Blue and Red lines. We do not need to get rid of any stations. We need to surround the stations with residentials/commercials/office/retail. We need to improve the system's speed but at the same time keep an eye out for density growth along the system as well. Actually, the only "station-change" I would make is to combine Tasman, Baypointe, and Champion together. They are literally 5 minutes walk apart from one another! Totally agree with your last statement ... especially Tasman & Baypointe! I understand that once upon a time, Baypointe was the end of the line. I think that's why it is such an impressive station. But now it's a virtual wasteland, whereas Tasman is quite busy all the time (being the transfer point). One thing to note is that there are 3 brand new apartment communities going up right in front (or with 5 mins walk) of Baypointe. An elevated (or subterranean) section of track to avoid the North 1st / Montague intersection would probably help things along ... both for the LRT and auto traffic. Just one line through Diridon? Shouldn't that be the center of all things trains down here? 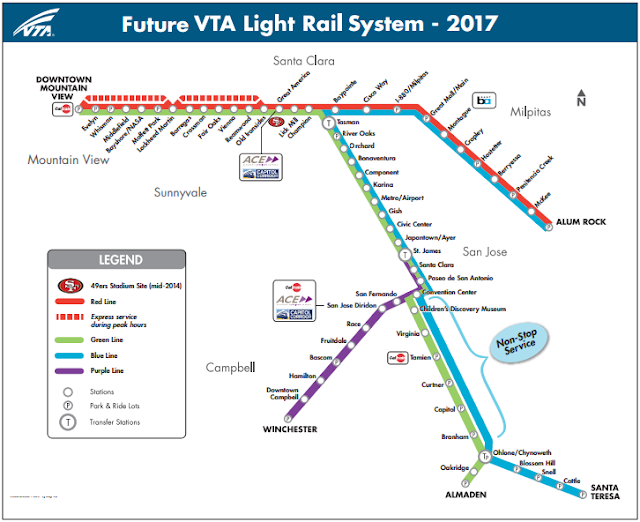 Santa Clara-Alum Rock BRT will go to Diridon (providing an east-west connection) and so will BART whenever phase two happens. I'd be thrilled to have BART at Diridon for starters. That won't be until the mid-2020's in my opinion. I think 2018 is when it reaches Berryessa. The one bit of good news is that the extension to Warm Springs and Milpitas is way ahead of schedule if I understand things correctly. That at least introduces the BART to Light Rail connection. BART at Berryessa is also ahead of schedule, and is going to be opened for 2017. But I do agree that it will be mid-2020's before we get BART to Diridon. That would pretty much be THE HOLY GRAIL right there. Between Caltrain and BART, the ring around the entire Bay Area will then be completed. Actually, the extension to Warm Springs is quite a bit behind schedule... it was originally slated to open in around late 2013/early 2014, now it's looking like late 2015. There is a web cam on the BART website for the Warm Springs construction, and these days it barely looks like anything is happening.